I know, I know, we just had breaking news yesterday. It’s like we’re becoming MSNBC where breaking news has become the norm and the phrase has lost all meaning. But it’s not my fault that we actually do have breaking news two days in a row! 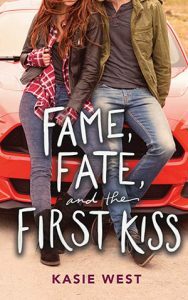 So today we celebrate Kasie West and her new book Fame, Fate, and the First Kiss which is officially out in the world. If you are not familiar with Kasie West, I’m not sure what kind of rock you’ve been living under, but get yourself to a bookstore and buy all of her books immediately. Now admittedly, there are several, but as soon as you start the first one, I think you’ll find yourself feeling what I feel, which is that there are never enough Kasie West books! So read more about Fame, Fate, and the First Kiss and buy it online here. And now, admire the beautiful cover with me. I especially love their faces. Congrats all around, and way to go, Kasie!